The ARC is open at two different times during the academic day. From 8am-4pm, academic coaches are available to work with students in one-on-one meetings. During study hall from 8-10pm, an English teacher is available for writing conferences. We are located in the Schoolhouse building on the second floor of the John Gray Park '28 Library. Visit the ARC for feedback on writing of all sorts, including expository essays, research papers, college essays, and creative writing. ARC teachers are available throughout the writing process, from brainstorming and outlining to drafting and revising. Other services include how to develop effective reading and note-taking skills, study strategies for homework and tests, and improved time management. We will help you set academic goals, and learn how to achieve those goals through specific action plans. 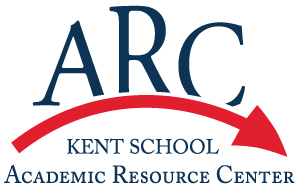 Your teacher may recommend that you go to the ARC, or you can drop in anytime during the academic day or study hall. Peer Tutors, assisting in research, writing, math and the sciences, are also available in the library during study hall. Bring your writing or homework assignment and whatever work you've done so far. Always arrive with all your class materials - planner (or other planning system), textbook, notebook, and folder of graded work. Come prepared to discuss what you like and what you don't like about your work. Be ready to be an active participant in the conference. If you don't know how to tackle your assignment, we'll help you brainstorm to come up with ideas. If you come with an idea, we'll help you turn it into a thesis. If you come with a thesis, we'll show you how to test if it's arguable and supportable. If you have already written your draft, we'll give you feedback on its strengths and weaknesses, and help you revise the areas that need rewriting. The tutor will not make corrections on your paper or tell you what to say. If you can't seem to finish all your homework before lights-out, we'll teach you new ways to manage your time. If you don't know how to take notes for Modern Euro, we'll share note-taking tips from successful Kent students. If you can't remember how to conjugate your Spanish verbs, we'll help you practice effective memorization strategies. If you want to prepare for fall term exams, you can create an exam prep plan in the ARC. We will expect that you arrive to your conference on time and with all your class materials. While you will learn effective study strategies during your ARC conference, it will be up to you to practice these tips on your own. Remember that it takes 7-21 times to make or break a habit! Even though you meet with an ARC teacher, you remain responsible for everything in your assignment or paper; you will decide whether to accept or reject the advice you receive. To make an appointment or for more information, contact Mrs. Booth.